On-ear headphones tend to be more portable than over-ear cans mainly because of the size factor. There’s just no way it can be convenient for full size headphones to be carried around unless it comes with a carry case. But still, they tend to take up space and aren’t as compact as on-ear headphones. Reading the title of this review, it’s obvious that the AKG K451 falls into the more portable category. AKG K451 is a small sealed on-ear headphone which I feel is on the smaller side of this headphone type. Headphones like the Sennheiser Momentum or Beyer DT1350 are also supraaurals however they’re much bigger than the K451. Still, I can’t really call it an ultra portable as it’s still bigger than the likes of Sennheiser PX200, Koss Porta Pro, Jays V-Jays, etc. The K451 costs 6,690 pesos locally (surprisingly more expensive the AKG K619 DJ) and it’s not hard to find it in the local stores here. If you’re not from Philippines, you can avail it from Amazon where it is widely available. Unfortunately I was not able to take pictures of the headphone while it was on my possession and with that said, I’ll just attach some photos found on other sites (with sources mentioned of course). The build is highly reminiscent of the K619 that we reviewed some time ago. It’s mostly made of plastic and the earpads are very soft and supple. The headband padding is a bit stiff however since the headphone itself is very light and there’s no clamp at all, it doesn’t pinch your ears at all. I would easily classify the comfort of the K451 on the same boat as the Momentum on-ear but mainly due to it’s lightness. 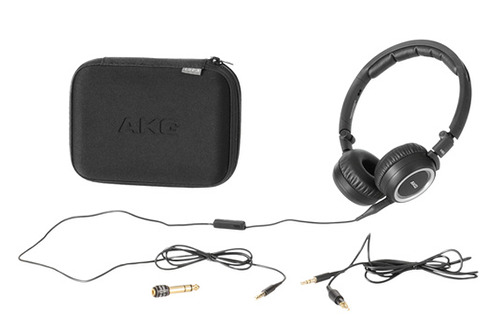 AKG K451 comes in with two cables, the standard straight plug and the one with remote microphone for Apple devices. That said, the cables are removable and is terminated on the left ear cup. I like the overall look of the headphones. It’s sort of plain-looking however I find it to be looking good when worn on my head. It’s funny because most headphones in reality don’t (i.e. DT1350 looks like a door knob on my head). It helps that the headphone is small and the arms don’t stick out too much. The headphone doesn’t seem to block out outside noise well. I’m not sure but the design of the earcups appears to me that it’s semi-open however doing some tests, there’s really no leakage in sound. Unfortunately the lack of passive noise isolation really hurt this headphone especially since it’s being marketed for portable use. The K619 easily slays the K451 in this department. I would be blunt and say that this headphone fell short in this area. First is that this headphone is small so getting a good seal consistently is a challenge due to the fact that they don’t clamp too much (and the cups are again small). When I get a good seal, I get good bass extension. Bass extends fairly deep and has good quantity surprisingly. It isn’t boomy but I’d say it’s tad accentuated. Again, this is assuming that you get a good seal. In practice, supra-aurals are just hard to make sound good as it rests on top of your ears as opposed to around your ear. This is why clamping force is a factor here. The overall midrange is where it starts to get problematic. The lower midrange is decent however it becomes uneven as it moves up to the upper midrange. This easily makes the voices of audio tracks sound confused and the overall perception that I have is it sounds very boxy. It’s like the the singer is singing inside a box and that it’s sometimes recessed and sometimes forward. Treble is withdrawn, more recessed than the K619 that I reviewed before. It also sounds ‘papery’ which is perhaps due to the treble being really low in level. The overall result is not very pleasing as the bass is the most audible part of the spectrum. Again the bass response is pretty good however, it’s the honky midrange and recessed treble that didn’t contribute well to the overall sound. And finally, as the headphone is designed for portable use, portable players can easily drive it to very loud volumes. Unfortunately, I won’t recommend the AKG K451 headphones. It is more expensive than the K619 model and while it’s more comfortable, it lacks on the sound department even against the cheaper AKG model. Both headphones have a remote mic and the only difference it seems is that the K451 has a detachable cable whereas the K619 doesn’t. Value-wise, it’s hard to see the K451 thriving against other headphones on the same price range. But if you’re into good quality bass that extends well and you’re not concerned too much about the other parts of the spectrum, then maybe the K451 is an option to say the least. That’s it! We would like to thank AKG Philippines for sending us this review unit. If you own (or have owned) this headphone, we’re interested to know your thoughts about it!